The Roost 9V Smart Battery takes an existing smoke or CO2 detector and makes it “smart” enough to send alerts to a smartphone. The $35 lithium Roost is the same size as a standard 9V battery, but has a Wi-Fi adapter on the bottom which links to a home network. If the alarm goes off, the Wi-Fi adapter wakes up and sends an alert through the cloud to all linked smartphones and tablets. A free app monitors the battery’s status and lets users share smoke-alarm alerts with friends and neighbors. A $65 Roost two-pack is also available. Roost 9V Smart Battery goes into any standard smoke alarm. There are many ways to miss a flight, but a dead cell phone shouldn’t be one of them. Unfortunately, new TSA security regulations for some foreign airports require that cell phones and other electronic devices be turned on while going through security. Devices that cannot power on won’t be allowed on flights. This rule doesn’t currently affect domestic U.S. flights; just some incoming international flights from certain destinations. One way to avoid such hassles is to travel with an external battery–one that connects with your phone or tablet via a standard USB cable. As long as you keep these portable power banks charged, you’ll always be able to give your device enough juice to power up and get through security. The good news is that many power banks are slim, stylish and inexpensive. When shopping, keep an eye on a battery’s milliampere-hour (mAh) rating, which gives you an idea of which devices it can charge and how long it can keep them going. 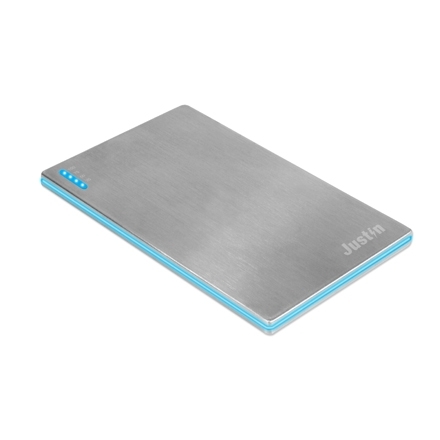 For example, Innvovative Technology estimates that its Justin-brand 2,000 mAh power banks provide enough power to add nine hours of talk and web surfing time to a smartphone and its 6,000 mAh units will increase smartphone time an extra 27 hours or add five hours of web, audio and video time to a tablet. For the sake of comparison, note that the internal battery of an Apple iPhone 5s is rated at 1,560 mAh. Innovative Technology’s Justin Slim Power Bank barely makes an impression in a jacket pocket but has enough room inside for a 2,000 mAh battery. Four LEDs let you know how much of a charge it has left. Moonstone power banks from Lepow (photo at top) are encased in smooth, polished plastic and come in an assortment of colors and power capacities. Moonstones comes in 3,000 mAh, 6,000 mAh and 9,000 mAh versions and provide two USB ports: one standard and one higher-powered, fast charge port. Thus you could charge a smartphone on one port and a tablet on the other. Moonstones are roughly three inches square but vary in thickness. Also colorful and stylish are the Magicstick power banks from Powerocks USA. The purse-size small cylinders house a 2,800 mAh battery and come in a choice of eight colors. The Champ Bodyguard Power Bank includes a personal alarm and a flashlight. The Champ Bodyguard Battery Rechargeable Power Bank adds a flashlight and a personal alarm siren to its capabilities as a 2,200 mAh lithium ion portable battery. Some coffee shops and restaurants, like the ones in New York’s Madison Square Garden and a few Starbucks locations in Boston, now offer wireless charging hotspots built into some of their tables. Place a compatible smartphone or battery on the right spot and the device will charge up without wires. The Duracell Powermat GoPower Overnighter charges smartphones and tablets with a standard USB cable, but the unit itself can be charged via an AC adapter or computer USB port or wirelessly by placing it on a Duracell or compatible wireless hotspot or charging station. The 4,400 mAh battery has a single USB port and comes precharged for immediate use. Rayovac’s inexpensive 2-Hour Power Pack doesn’t even need a USB cable. The small unit has a built-in micro USB port and plugs directly into your smartphone. Instead of a built in rechargeable battery, it uses a removable Rayovac CR123a battery, which you may be able to find at an airport electronics stores should your unit run down at the wrong time. A similar version with a connector for the iPhone 4S and earlier iPhones is also available. Like the Lepow Moonstone, the Anker 2nd Gen Astro series chargers can charge two devices at the same time via two USB ports. Anker’s PowerIQ technology in the 2nd Gen Astro (6,000 mAh), Astro2 (9,000 mAh) and Astro3 (12,000 mAh) identifies the device connected to each intelligent USB port and adjusts the charging current accordingly. The Anker 2nd Gen Astro series units lack buttons: To wake them up you simply shake them. A circular power readout lets you know how much of a charge is left inside. Of course none of the above power banks will do you much good at the airport security gate or anywhere else unless you remember to charge them regularly. So power up and happy travels.